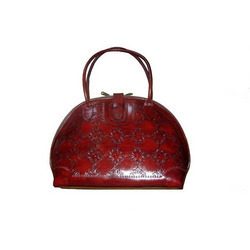 Our range of products include handmade leather handybag, handmade leather satchel bags, handmade leather stamp designs lady handbags, handmade leather tote bag, handmade leather lady hand bag and handmade leather bag. It is made by Handmade Leather. It is available all colours. There is 2 zip sections. We used cotton lining. It is made out of handmade leather. There is one middle open section. there is 2 zip section in front and back. 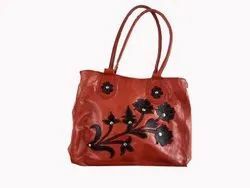 Description: It is made by Handmade leather with stamped designs on it. There is adjustable shoulder strap as well. It is 100% Hand made Leather. It is stamped designon the Leather. we provide cell phone holder, pen holder indide the bag. Even there is one more small portion by zip. It is available in diffirent design and color also. 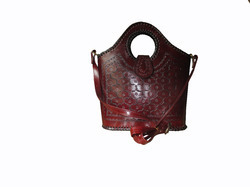 We are one of the leading manufacturers and suppliers of premium-quality Ladies Leather Bag. They are fabricated using superior-quality raw-materials in compliance with the prevailing industrial norms and guidelines. They are quality-tested by professional auditors before dispatch as well. 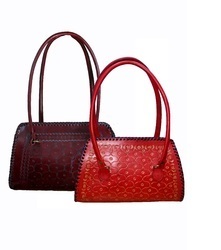 These bags are made of completely pure leather in compliance with industrial quality standards. They are available in plain forms as well as with designs carved or stamped upon their surfaces. They are spacious and have three different compartments for the storage of different items. They also have a separate zipper which is rust-resistant. 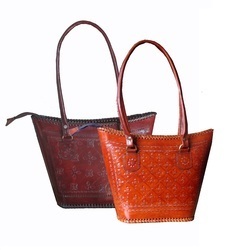 Clients can avail these bags from us at quality-tested rates in customized specifications. They are available with or without handles. in diffirent design and color also. we provide cell phone holder, pen holder. Even there is one more small portion by zip. 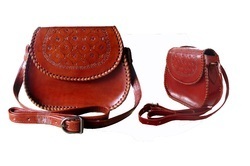 Code no: LHB005It is made by soft leather stitched leather designs on the leather. 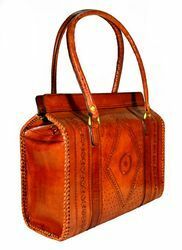 Looking for Handmade Leather Bags ?